I am delighted to be amongst you today. It is indeed appropriate that the Gandhi Peace Prize for 2014 is being conferred on the Indian Space Research Organization (ISRO) in recognition of its services in transforming India through the use of space technology and space based services. 2. The Government of India instituted the Gandhi Peace Prize in 1995 on the occasion of the 125th birth anniversary of Mahatma Gandhi as a tribute to his ideals. 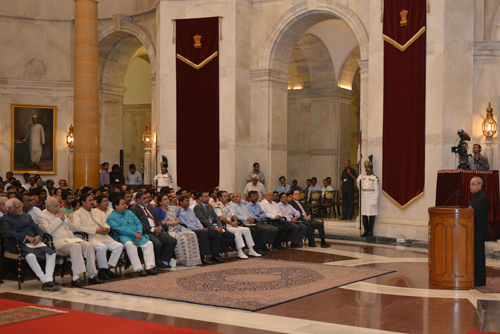 The Gandhi Peace Prize is awarded to individuals and institutions for their contributions towards social, economic and political transformation achieved through non-violence and other Gandhian methods.ISRO today joins the ranks of other eminent institutions such as the Rama Krishna Mission, the Grameen Bank of Bangladesh and the Bhartiya Vidya Bhawan who have been conferred this prestigious award in recent times. 3. ISRO has come a long way since its inception in 1969. The relevance of space research was questioned by many at that time. In the words of the late Dr A P J Abdul Kalam, "Many individuals with myopic vision questioned the relevance of space activities in a newly independent nation, which was finding it difficult to feed its population. Their vision was clear if Indians were to play meaningful role in the community of nations, they must be second to none in the application of advanced technologies to their real-life problems”. 4. India’s entry into the space arena was led by the visionary scientist, Dr. Vikram Sarabhai who foresaw the tremendous potential of space technology and its applications in addressing the needs of our country’s development. Countering the challenges of scarce resources, limited technical manpower and physical infrastructure in the early years, ISRO has today established operational space systems and services, attained self-reliance in development of indigenous technology and accomplished exemplary feats in space exploration. It has, at the same time, remained true to its mission of bringing space to the service of the common man. 5. From a humble beginning, launching small sounding rockets from Thumba for atmospheric studies, ISRO is today one of the six largest space agencies of the world.It has built an indigenous Polar Satellite Launch Vehicle (PSLV) which is one of the most sought after launch vehicles in its class across the world. It has achieved 29 successful flights of the PSLV launching not only Indian satellites but also 45 satellites of 19 other countries. The recent launch of five satellites of the United Kingdom marked a new milestone in demonstrating the performance and reliability of the PSLV. ISRO has also successfully built the Geosynchronous Satellite Launch Vehicle (GSLV) with an indigenous cryogenic engine. 6. Scripting space history on September 24, 2014 India successfully placed the Mars Orbiter around Mars. It is the only country in the world to achieve this feat in its first attempt and the fourth space agency in the world to reach Mars. It makes us even more proud that this mission was achieved at a fraction of the cost incurred by other successful nations. In 2008, the Indian tricolour was planted on the lunar surface by ‘Chandrayaan-1’ on its maiden mission to the Moon, a mission which also led to the discovery of water in the lunar atmosphere. 7. ISRO has similarly deployed a Space Based Augmentation System "GAGAN” for use by the aviation sector for precise position information services, safety-of-life applications and better air traffic management over Indian airspace. India is the fourth country in the world after USA, Japan and the European Union to offer such services. 8. India has today, through ISRO, established a well-knit endogenous space infrastructure with adequate ground systems and in-situ observation networks to support a multitude of applications. These applications address social, economic and cultural aspects of Indian society and provide inputs for informed decision-making at various levels. ISRO’s people centric space programmes are designed to support various national priorities such as food & water security, sustainable environmental practices, conservation of resources, livelihood support, poverty alleviation, rural prosperity, education and health care and disaster management amongst others. 9. Permit me to expand on a few initiatives of ISRO which have led to significant societal transformation in India, embodying a practical realization of Gandhian goals. ISRO’s Satellite Instructional Television Experiment (SITE) launched in 1975 was a pioneer in making available informational television programmes to rural India with the objective of educating the rural populace on various issues related to agricultural practices, occupational skills, general health and hygiene, family planning etc. The SITE transmissions had a significant impact on Indian villages and paved the path for use of advanced satellite broadcasting technology to fulfil the socio-economic needs of the country. Our satellite based networks are today playing a key role in taking education, health care and rural connectivity to the remotest parts of our country. India, on account of widely varying geo-climatic conditions, has always been vulnerable to natural disasters such as floods, earthquakes and cyclones. ISRO’s Earth Observation, Meteorological and Communication satellites are a core component of the disaster management scenario of the country. Meteorological satellites are used extensively to monitor weather events and forecast weather, including the genesis of cyclones, their track and landfall prediction. This helps minimize damage to life and property. The value added products generated using satellite imagery help address information needs of all phases of disaster management such as preparedness, early warning, response, relief, rehabilitation, recovery and mitigation. Millions of people living along the 7500 km long coastline in India are dependent on fishing for their livelihood. As fish stocks dwindle and move further offshore, search time, cost and effort increase for fishermen. Satellite based fishing zone advisories are made available in local languages on a daily basis to the fishing community resulting in enhanced fish catches, reduced search times and resultant savings in fuel costs, thereby improving the well-being and quality of life of our fishermen. Speaking about the conservation of natural resources and protection of our environment, Mahatma Gandhi had said and I quote , "The earth, the air, the land and the water are not an inheritance from our fore fathers but on loan from our children. So we have to handover to them at least as it was handed over to us.”(Unquote). Space applications have been suitably adapted to respond to the needs of integrated watershed development in the country, conservation of soil and water resources, and protection of the environment. They have helped draw up developmental plans for enhancing agricultural production in rain-fed areas leading to rural prosperity. Developmental plans drawn up at micro-watershed level using remote sensing images have resulted in increase in cropping intensity and crop yield, decrease in fallow lands, reclamation of wastelands, increase in irrigated crops and livelihood improvements. Mahatma Gandhi had advocated democratic decentralization and Panchayati Raj where each village was responsible for its own affairs. ISRO’s programme of ‘Space Based Information Support for Decentralized Planning’ is inspired by Gandhiji’s vision of ‘Gram Swaraj’ or village self-governance. Under this programme, state-wise thematic databases on natural resources are being generated for the entire country. These spatial databases integrated with field level information and traditional wisdom help in preparation of locale-specific action plans for land and water management with people’s participation. A database of heritage sites and Site Management Plans drawn up using space technology helps policy planners take informed decisions regarding conservation and preservation and also enables monitoring of activities onsite. A pilot study has been carried out for the Hampi world heritage site. Space based technology tools are also being planned for mapping and identifying the vulnerability of each monument and for preparing plans to track and mitigate environmental or weather changes that may have an adverse impact on fragile monuments. Self-reliance and development of indigenous technology is a key policy of ISRO and its success in this endeavour can be seen in the areas of launch vehicles, satellites, communication, meteorology, space science and establishing of the required ground infrastructure. 16. Science and Technology is a key driver for shaping the destiny of nations and people across the globe. Technology is built not so much by individuals but by organizations. The characteristics of organizations – their leaders, their structures and their cultures have a great bearing on catalysing innovations and putting them to use for the benefit of society. ISRO is one such Indian organisation, which has nurtured, developed and demonstrated world class capabilities. Even as it has sought to encompass the globe and reach for the stars, it has remained rooted in its core mission of national regeneration and improving the life of the common man, a goal set for the nation by Mahatma Gandhi. 17. I salute the ISRO Team for its committed, tireless and sustained service to the nation. I congratulate each and every member of the Indian Space community on ISRO being awarded the coveted Gandhi Peace Prize. I am confident that ISRO will continue to scale greater heights and bring glory to India in the years to come.